Gourmet delicacies - Learn to COOK & MEET new international friends! A choice of premium Italian gourmet delicacies carefully selected by "Cook & Meet Emporio" directly by the producers and delivered to your doorstep. Description: a flavourful premium oil to bring the full truffle aroma to dishes like fresh pasta, meat and salads. Only best quality Italian white truffles are hand selected by experts before confectioning in jars with artisan methods to be tasted all year long. Ingredients: white and black truffles (7%), butter, flavourings.. Description: a flavourful oil to bring the full truffle aroma to dishes like fresh pasta, meat and salads. Only best quality Italian white truffles are hand selected by experts to prepare a premium dressing. Ingredients: black truffle "tuber aestivum" (2%), butter, salt, flavourings. 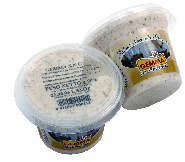 Description: add a peculiar truffle taste and flavour to pasta, risotto, canapes and meat. 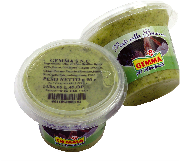 Ingredients: 58% chopped black truffle "tuber macrosporum", olive oil, salt, seasoning. 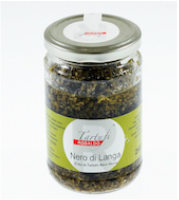 ​Description: "Nero di Langa" is a flavourful artisanal preparation particularly rich in truffle content, perfect for canape´ and as base for pasta dressing. Ingredients: white truffles (3%), porcini mushrooms (84%), olive oil, seasoning. 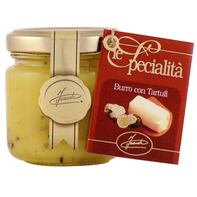 Description: "La Tartufata" is a patented and prize-winning refined white truffle and porcini mushroom cream to be served on canapes and as dressing for fresh pasta, rice and meat. Ingredients: assorted fish and mollusk, vegetable oil, flavourings. Description: a tasty starter prepared with premium fish and seafood from the Mediterranean sea and gourmet flavours. Description: a classic dressing for Italian pasta like troffie, linguine with all the intense flavours of the Mediterranean sea. Extra virgin olive oil "Il casolare"
Description: the staple of Mediterranean cuisine, a rich, intense, full-flavour, unfiltered olive oil extracted with cold squeeze technique. Ingredients: roast veal "girello", mayonese, tuna, flavourings. Description: a classic delicacy of regional Piedmontese cuisine made of delicate slices of roasted veal dressed with a refined tuna and capers sauce.. Description: a delicate, refined ​dressing ideal for Italian pasta like fresh tagliatelle, particularly rich in premium quality walnuts. Ingredients: peppers, tuna, capers, vegetable oil, seasoning. Description: the full taste of south Italy in a classic preparation combining the intense taste of moderately hot peppers, juicy capers and tuna filling.